In my previous post, Lyonizing Word: Workflow for Writing, I suggested some tools that would help authors write without the problems that are almost inevitable when working in Microsoft Word. These include inconsistent and meaningless formatting, document corruption, fouled-up footnotes, incorrect AutoCorrect “corrections,” and so on. Unfortunately, most authors already use Word and aren’t likely to change. How can we, as editors, help them create Word documents that are well-structured and clean, thus reducing our own workload? 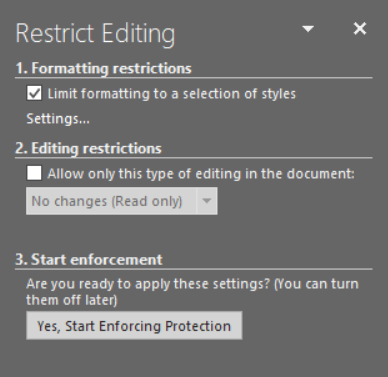 Word itself includes a feature that helps make this possible, although I doubt that many editors or authors are even aware of it: Restrict Editing. 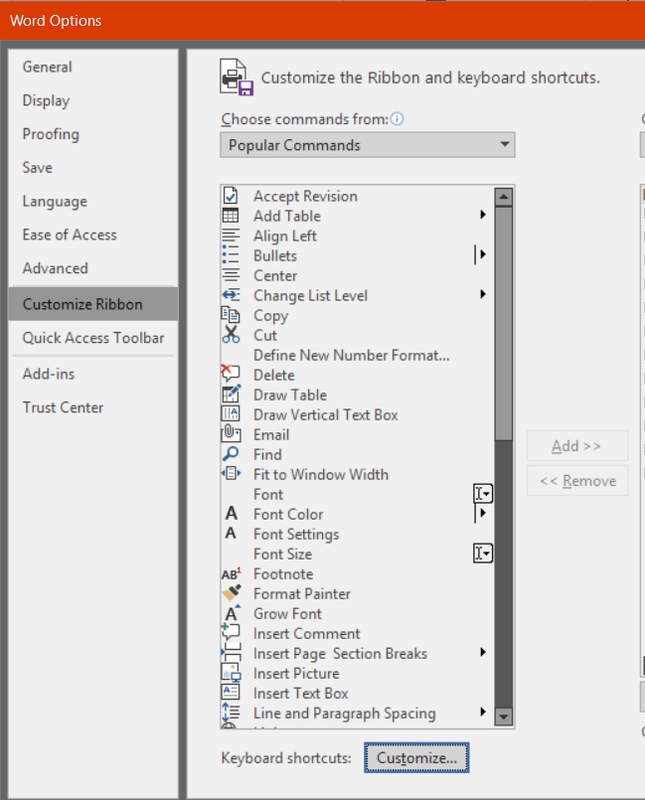 You’ll find this feature on Word’s Ribbon interface under the Review tab. What does it do? It prevents authors from using arbitrary, meaningless formatting, applying various fonts in various sizes higgledy-piggledy all over the place as authors are wont to do. The only formatting they can do is with styles — and then only with the styles that you allow. You will like this. And your designer will like this. And your typesetter will like this. 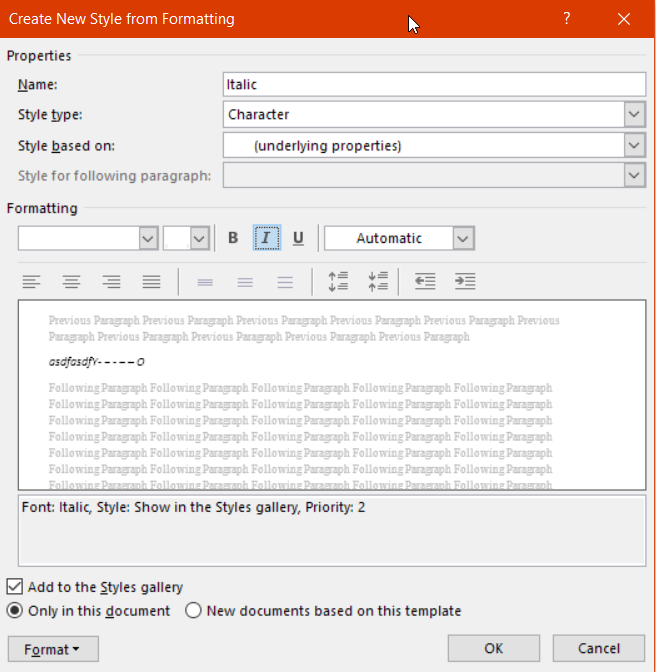 In Word, create a new document. Click the Restrict Editing icon (far right). Just below that, click Settings. Under the Formatting heading, make sure the first box is unchecked and the last two are. To enforce protection, enter a password, confirm it, and click OK. The password doesn’t need to be long and complex; it just needs to be something your authors won’t guess and that you will remember. In fact, something as simple as your initials will do. After you’ve entered a password, your authors can’t turn off protection, so it really is protection. Give the document to your authors, instructing them to write their masterpieces in that document and no other. What, no bold? Not unless you’re working with an author whose field requires bold — some branches of math or medicine, perhaps. But for most authors, access to bold means they’ll try to use it to format headings when they should be using a heading style, such as Heading 2 or Heading 3. What, no underline? Again, not unless you’re working with an author whose field requires it. Otherwise, some authors will use underlining when they should be using italic — a holdover from the days of the typewriter. For the time being, stop enforcing protection on the document. Otherwise, you won’t be able to create a new style. You remember your password, right? Click the little arrow at the bottom right of Home > Styles to open the Styles task pane on the right. At the bottom of the task pane, click the little New Style icon on the bottom left. Give your style a name, such as Italic. In the box labeled “Style type,” click the dropdown arrow and select Character. This is key to making this work. Under Formatting, click the Italic button. Repeat the process for any other character styles your authors will need. Again enforce protection for the document. A side benefit to using character styles is that they can be imported into InDesign, where they can be set to use whatever formatting is needed — something that isn’t possible with directly applied formatting like italic or bold. Under the File tab, click Options > Customize Ribbon. Click the button labeled “Keyboard shortcuts: Customize” on the bottom left. In the Categories box on the left, scroll to the bottom and select Styles. In the Styles box on the right, select the style you created earlier (such as Italic). Put your cursor in the box labeled “Press new shortcut key” and, well, press a new shortcut key. Let’s use CTRL + I for our italic character style. Click the dropdown arrow in the box labeled “Save changes in:” and select your document. Now your keyboard shortcut will be saved in the document rather than in your Normal template. Don’t skip this step! Click the Assign button on the lower left. Click the Close button on the lower right. Give the document to your authors. 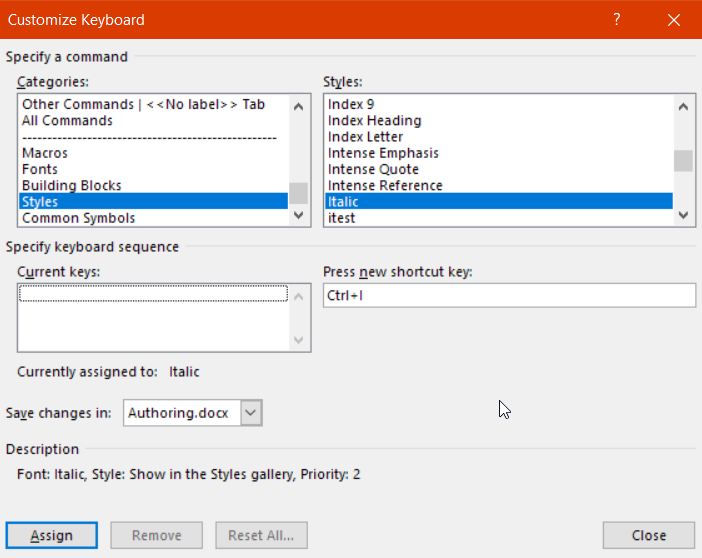 Now when your authors select some text and press CTRL + I, the Italic character style will be applied, so they can work without using the mouse to select the Italic style in the Styles task pane. Easy, intuitive, perfect. Rinse and repeat, with the appropriate keyboard shortcuts, for your other character styles. At this point, you may be wondering why I didn’t just create this document for you. Stay tuned; next time I will, with a few little extras to make your life easier. But if you ever need to do all of this yourself, now you know how. Today’s guest article is by Jack Lyon, an editor, the owner of The Editorium, and creator of many macros that editors and publishers around the world use (his macros are available at The Editorium). In his article, Jack ponders on some of the “invisibles” in book publishing. A little man who wasn’t there. Oh, how I wish he’d go away! In a recent post on An American Editor, Rich Adin posits that eBooks may be sounding the death knell for authorial greatness (see Are eBooks the Death Knell of Authorial Greatness?). Why? Because unlike printed books sitting on a shelf, ebooks are not immediately visible to our view; we have to go find them on our ereader, or search for them online. “Out of sight, out of mind,” as the saying goes. I won’t repeat Rich’s arguments here; you should read them for yourself. But I do believe that Rich is onto something important, and his post made me think about other things that are becoming invisible in this modern age. What if your cell phone worked that way? Suppose your phone gave no indication—no ringtone, no flashing light—that a call was coming in. The only way to know would be to pick up your phone periodically and listen. Does that seem like a good system? Is an author’s text really so elegant that it should not be besmirched with superscript note references? Give readers a break; if there’s a note, give them some indication. Professional indexers and seasoned readers know that a good index is an essential part of a good nonfiction book. Not only does it allow you to find particular passages, but it also gives you an overview of a book’s contents. 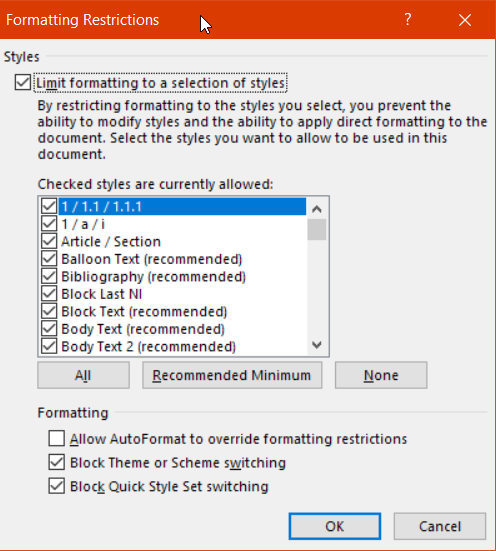 Does the latest tome on Microsoft Word have anything new to say about macros? Check the index. Some web designers think that how a web page looks is much more important than how it works. They’re wrong about that. Imagine a web page so “artfully” done, so minimal in its design, that it offers no indication of how users should navigate the site. You would actually have to move your cursor around the screen to see what areas might be “clickable.” That’s the extreme, of course, but there are sites that offer little more than that. Google “minimalist web page” and you’ll find some. Several years ago I attended the product launch for a specialized search engine. The interface had an elaborately designed logo with the word “Search.” Below that was a box where users could enter the text they wanted to find. Wanting to demonstrate the simplicity of the new search engine, the CEO invited his wife to step onto the platform and search for something, implying that if she could use the program, anyone could. (Unfortunately, this also demonstrated his own stupidity and callousness, but that’s another story.) His wife entered some text but then couldn’t find where to click to activate the search. There was no button, no menu, nothing. Finally the CEO grabbed the mouse and clicked on the logo to activate the search. After all, it did say “Search.” The problem was, it didn’t look like something to click; it looked like a logo. Furthermore, it was above the text box; but things should always appear in the order of use: First enter your text, then click “Search”—which means that the Search button should have come below the text box, not above it. Form should always follow function; how something looks should always be subordinate to how it works. A button should look like a button. Not that there’s anything wrong with simplicity. As Albert Einstein once said, “Everything should be as simple as possible, but never simpler.” Those who are involved in any kind of communication—which means all of us—need to keep that in mind. What do you think? Is Jack onto something that has changed with the advent of technological changes to how books are produced? Has technology changed us from specialists to generalists who know just enough to get us into trouble?